double standard by the higher education minister – welcome! from the nutgraph ‘act allows varsity students at anti-israel protest’. KUALA LUMPUR, 8 Jan 2009: University students and their institutions can organise and participate in protests against the Israeli invasion of Palestine, Higher Education Minister Datuk Seri Mohamed Khaled Nordin said today. He said the ministry had no objection to the students and universities staging such a protest as the amended Universities and University Colleges Act allowed it. "I believe students can be involved in mass demonstrations like that. The amendment to the Act allows the students to participate in such activities, so there will be no problem for them to make their stand," he said. yakah? what if the students wants to protest against hamas? boleh tak? 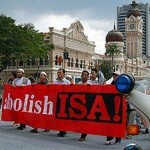 what if the students wants to protest against ISA, OSA, PPA (malaysian acts)? boleh tak? Mohamed Khaled said it was not necessary for the students to get a permit for the demonstrations but they had to inform the university of their activities for safety reasons. wahh! no need permit! how i wish i am a U student then i can organise an anti-isa vigil at the campus without permit. ‘safety reasons’? oic. they are students. to some, like one police chief in selangor, will consider them as children – and didn’t he said children should not be allowed in protest? aha!! AHAA!!! umno youth!! no wonder lah!! i can see clearly now, that the word ‘umno’ comes up. let’s see one fine day if DAP or PAS will to organise some protest, will you allow the students to take part. i can’t believe it!! our education minister is brainwashing the students and bringing politics to them. incredible!! read from the malaysian insider ‘students in mass movement against israeli atrocities‘ – why didn’t kerimsuddin or the son-in-law or any umno youth earlier on call on the students to protest against the atrocities by the muslim terrorists on the foreigners in mumbai, india? well, they were urged to kill their victims in cold blood and fight to death in the name of islam. there was a cover up that the victims were sexually humiliated before they were killed! such atrocities! this is terrible! this is unfair! this is yeah you are right, this is double standard! PUTRAJAYA, Jan 8 —School students nationwide will be galvanised into a mass movement aimed at instilling hatred against Israeli atrocities on Palestinians, said Education Minister Datuk Seri Hishammuddin Tun Hussein. Hishammuddin said the mass movement would involve those in the teaching profession and education ministry staff. “Through the mass movement, the students will be exposed and reminded that the peace, justice and comfortable living environment can be easily robbed by people with greed," he told reporters after presenting the ministry’s new year address here today. The movement to be launched soon would involve all quarters including non-governmental organisations (NGO) and ministries to make the voice of young Malaysians heard globally. human rights, voters rights… students rights?